THE PRIDE FLAG is expected to fly above Dublin’s City Hall during Pride Week next summer. Sinn Féín Chris Andrews has put down a motion which is to be voted on by the council on Monday. He expects no significant opposition to the matter. Speaking to TheJournal.ie, Andrews said that the symbolism is important and that the marriage equality referendum wasn’t the end of the fight for equality. He said: “I put a motion down to the city council protocol committee. It was agreed and it’s to be voted on on Monday. It’ll certainly be agreed to. I don’t think there’ll be any opposition to it. The only opposition I can think of is if someone brings it up on a procedural matter. “Personally I think it’s something that the council should do. Some have expressed opposition to flying flags that we wouldn’t usually. We shouldn’t be too precious about these things. It’s an important thing to do. Just because marriage equality came about recently doesn’t mean that the LGBT community has achieved equality – there’s a lot more to do. The Sinn Féín councillor has proposed a number of different flags fly over City Hall. Last month, he climbed atop city hall, and held aloft a Catalonian flag, during a demonstration after their independence referendum in the Spanish region. He told TheJournal.ie that he did it as a gesture of solidarity with the Catalonian people. 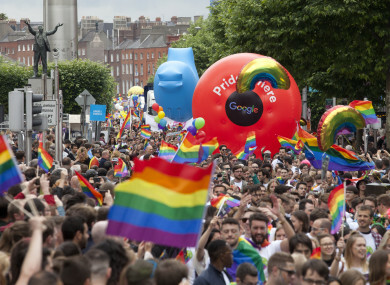 Email “'It's a show of solidarity': Pride flag set to fly over Dublin City Hall next summer”. Feedback on “'It's a show of solidarity': Pride flag set to fly over Dublin City Hall next summer”.